The video of Maldenado’s remarks is here. His prepared remarks begin at 01:18:00, and can be read here in English. He then answers questions at 2:18:31. 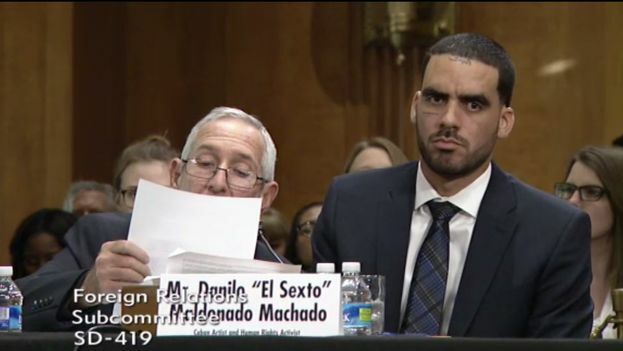 14ymedio, Mario Penton, Miami, 16 February 2017 — Danilo Maldonado, El Sexto, a well-known Cuban graffiti artist and human rights activist, appeared before the United States Senate Subcommittee on Western Hemisphere, Transnational Crime, Civilian Security, Democracy, Human Rights, and Global Women’s Issues on Thursday, and called for solidarity with the cause of democracy in Cuba. “First, we request solidarity for the cause of democracy in Cuba, given that we have suffered a regime that does not allow democratic elections for almost 60 years. The world should give us solidarity and should ask Raul Castro for a plebiscite and democratic elections in Cuba,” said Maldonado in his informal remarks before Marco Rubio, a Cuban-American senator who presided over the panel. The artist asked the people and the government of the United States to put pressure on Castro to release the “thousands of political prisoners” in Cuban prisons. According to El Sexto, 85% of the Cuban prison population would be considered innocent if they had been tried under the laws of democratic countries. “If there is someone who does not respect human rights and is complicit in murder, how is it possible that they do not have to appear before a court?” asked Maldonado. “It does not matter how they can help me, but how they help 11 million Cubans who are constantly trying to escape,” he said. The artist described the violations of human rights on the island and emphasized the lack of freedoms for artistic creation. “In Cuba, freedom of speech by artists is prohibited by Article 39 of the Constitution. According to this, “artistic creation is free provided that its contents is not contrary to the Revolution.” This means that the work of artists such as myself and my colleagues Gorki Águila and Tania Brugera, who is critical of the dictatory regime of the Castro brothers, is illegal in Cuba,” he said. The graffiti artist recalled that in 2014 he was imprisoned for ten months for attempting a performance art piece in Havana’s Central Park inspired by the novel George Orwell’s Animal Farm. “During that time I was tortured physically and psychologically by the dictatorship to the point that I declared myself on hunger strike and even considered the possibility of letting myself die in prison as a result,” he said. El Sexto explained that he was imprisoned four times because of the lack of freedoms, the last of which occurred after the death of former Cuban President Fidel Castro last November, when he painted graffiti on an exterior wall of the Habana Libre Hotel. The artist was detained for two months in the Combinado del Este prison on the outskirts of the Cuban capital. With regards to his graffiti and the call he made through social networks to celebrate the death of Castro, he explained that he did so following the example of Vaclav Havel, the former president of the Czech Republic who had a leading role in the Velvet Revolution that ended with The communist government in 1989. “Havel advised all those who, like him, had to live under communist totalitarianism, to Live In Truth. To stop pretending that the reality imposed by the regime by force is genuine,” he added. El Sexto told the congressmen that once arrested he was beaten and tortured psychologically. El Sexto accused the Castro brothers of being “murderers.” He cited as examples the victims of the 13 de Marzo Tugboat massacre, the thousands of executions, and the deaths of Laura Pollán and Oswaldo Payá. “The Castro have supported guerrillas and dictatorial regimes in different parts of the world,” he said and accused the Cuban government of supporting the dictatorial system of the Chavista regime in Venezuela. “All Cubans are hostage of the Castro brothers’ regime and the life of all Cubans, particularly artists, opponents, and dissidents, are under permanent danger at the hands of the repressive dictatorship. Once again we need the solidarity of the United States and the support of all people of the world,” he said.